as seen in article here. Last year, we learned that getting tattoos has a side effect that no one knew about—toxic ink buildup in the body—and it got us thinking. What don't we know about our other favorite alternative body decor, piercings? Do they have crazy side effects we might not be thinking about, too? To understand the impact current piercings may have on us and the powers behind any potential new ones, we turned to our community of trusted acupuncturists who have a nuanced understanding of needles, metals, and how they might affect our bodies, whether it's right after the piercing or a long-term lasting effect. Here's what they had to say. 1. The action of piercing on meridian lines won't have a lasting effect. "People have claimed that certain piercings on the ears might help with migraines and other ailments. I’ve also heard people claim that tattoos might have therapeutic effects by stimulating pressure points or acupoints. In both cases, I don’t think they have a long term affect. Your body gets desensitized to the stimulation of a point after 20 to 40 minutes. Studies have come out showing the biomechanical response to acupuncture points. They’ve shown that connective tissue subtly wraps around the needle and connects to it. It’s called “needle grasp,” and this is what we acupuncturists feel as “de qi” which we translate to “the qi arriving at the needle.” It feels like a very subtle tug of a fish on a line. That feeling is how I know I’ve hit the right spot and that your body is responding to the needle the way I want it to. Interestingly, the studies also show that this “needle grasp” effect stops after 20 to 30 minutes, as your brain gets desensitized to the messages it receives from your body’s reaction to the needle. I personally think it’s so cool because that’s what the classic Chinese Medicine texts have told us—to only retain needles for 20 to 40 minutes. And they’ve confirmed why with modern science. So neat!" 2. But choose your location and metals with intention—based on meridians, not just aesthetic. "Piercings in the naval area—the conception vessel—can affect fertility. The tongue ring can also affect digestion and heart energy, and other areas. I have also seen a lot of clients who have their ears stretched/gauged complain about headaches, as the lobe area of the ear correlates to the head. There is absolutely a connection with the piercings. One more thing to consider is the metal you choose for your piercing. The type of metal can make a difference in energetics, gold is more tonifying or supportive where silver is more sedative or releasing of blocked energy." "In Chinese medicine and acupuncture, needles are put into merdians of the body which are extensions of the nervous system, in order to activate a nervous response. Generally, after 28 minutes, the body's blood cycle has done one full round about and we feel it's sufficient enough time-wise to remove the needle from the meridians. By keeping a certain object, generally metal, in one area that's pierced through and through, can be considered draining as for the body because of overstimulation. 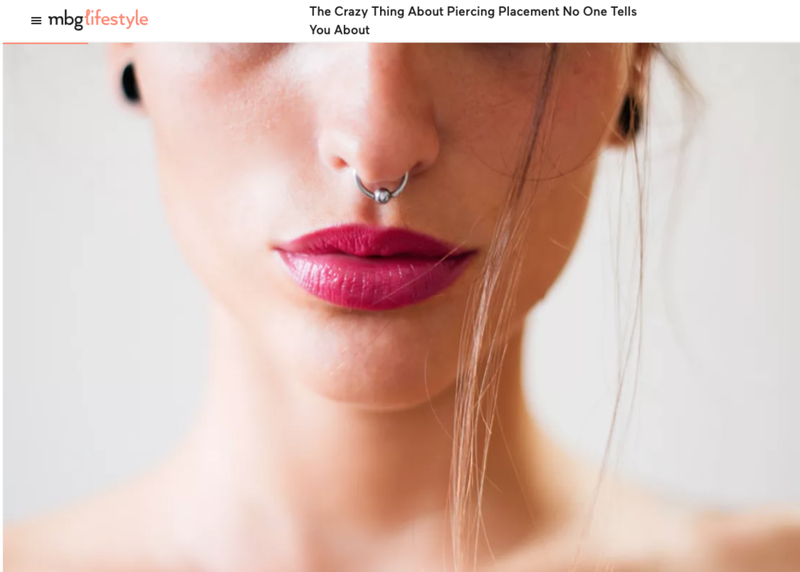 Additionally, there have been reported issues with tongue piercings and digestive issues, that were pierced in the correlates digestive area of the tongue Microsystem." 3. Are piercings an unexpected migraine remedy? "One recurring theme that comes up in the piercing world is that a Daith ear piercing can help treat migraines. "It's a controversial topic, the Daith piercing, to help treat migraines. Some sufferers really swear by the piercing, because the metal from the piercing stimulates the acupressure point in the ear for migraine relief. I suggest using ear seeds if you don’t want to go through the process of piercing." Anytime you put pressure or an intention or a piercing on an acupuncture meridian or point you are accessing the energy of that channel. So depending on what you want to do, you'd put a piercing on an acupuncture point for grounding or uplifting or set an intention for that point when you went to get it pierced or tattooed. 4. If you have any autoimmune diseases, you might want to reconsider. "I think piercings do affect the overall energy of the body and can influence "qi." Piercings can create scar tissue that block energy, while the metal jewelry also affects conduction of energy and can create an inflammatory response. I find that patients with weaker immune systems, poor gut health and genetic markers that impair detoxification all can increase the health risk of piercings." What a relief! Piercings don't seem to have the same universal ramifications as multiple, heavy-ink tattoos. With piercings, as with anything we do to or put inside our bodies, staying healthy, healing, and cultivating good energy is all about intention.